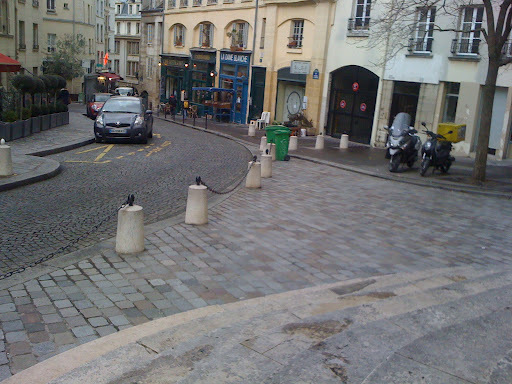 Today I took one of the free Discover walking tours of the Left Bank. This was our guide. unfortunately with an unpronounceable name. All guides have to be born Parisiens. She was excellent and entertaining. She confessed that this was her first walk. 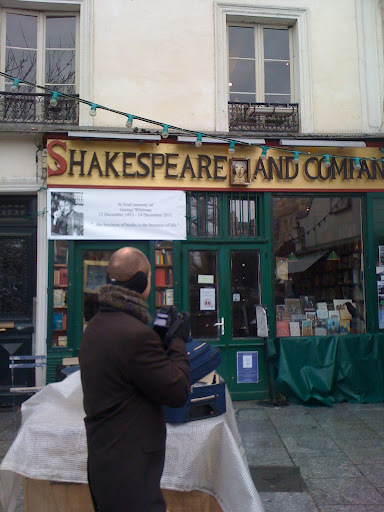 She took us past Shakespeare and company. The old library type book shop opened by Sylvia beach in 1919 and carried on by George Whitman in it’s present site opposite Notre dame. George sadly died in December but the shop has been a friend to hundreds of aspiring writers. 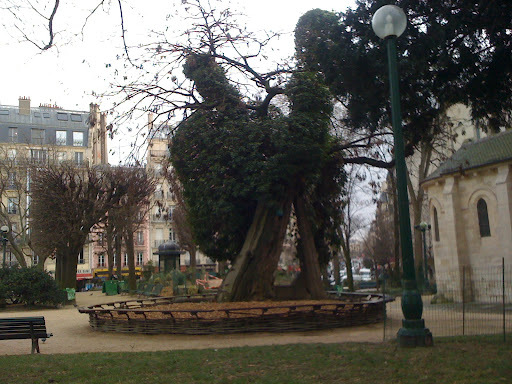 The oldest tree in Paris, situated in the garden of St Julien le Pauvre, a reformed man of violence, who took the poor across the Seine for free to atone for his sins and (the legend goes) one day Jesus appeared to him as a leper passenger and said he was forgiven. 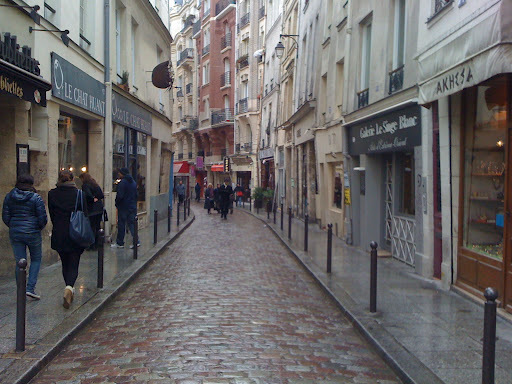 The windy medieval streets of the Latin quarter. So called because the original students would talk in Latin at the Sorbonne, a place of learning established by a man of the same name. These wall plaques were used to identify addresses. 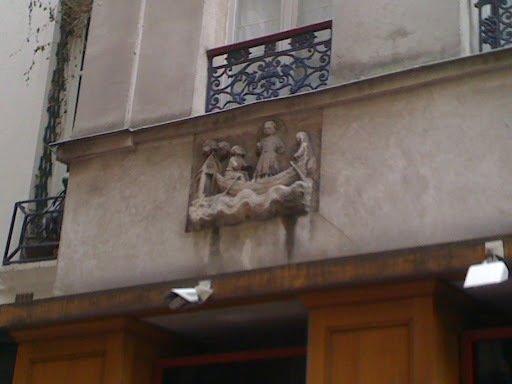 This one shows the legend of St Julien le Pauvre On Rue Galande. The guide talked about the architecture and the way of life in those days illustrated by pictures from her book. 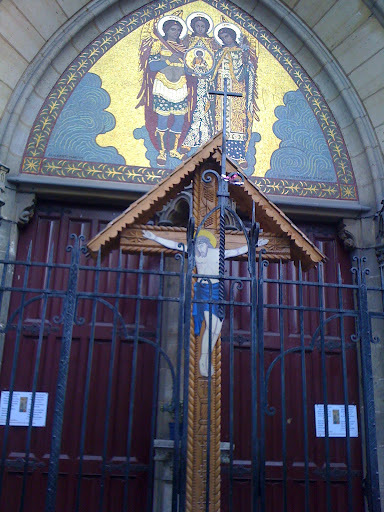 A beautiful church entrance in the 5th arrondisseement. 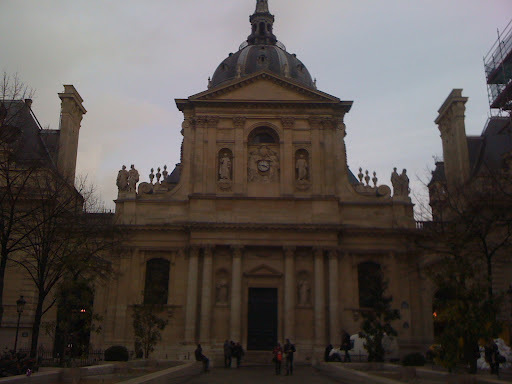 The Sorbonne. 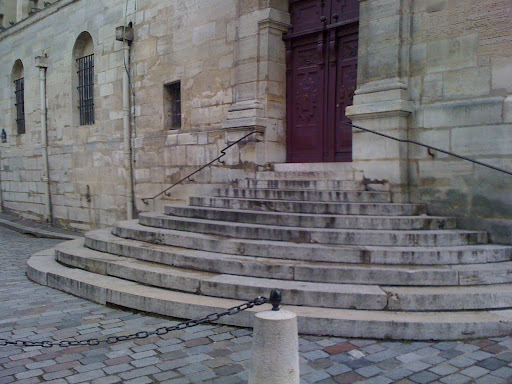 Founded by Robert de Sorbon in 1257. She talked about well known French men, philosophers, architect,writers and artists, who had lived in this area, showed us sites of historical interest. The 1968 revolt, which I remember.and what life is like for students today .The Paris cinema scene , which I have just discovered. 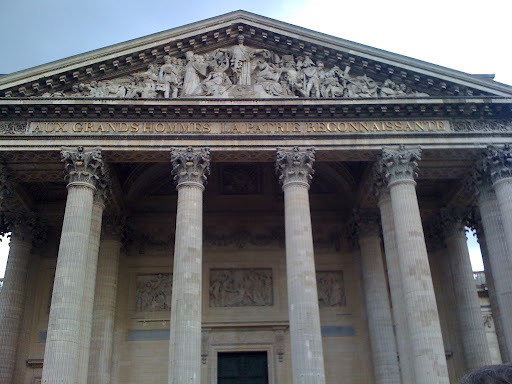 We ended at the Pantheon, where so many famous French people are buried and I gave her a big tip. Well worth the money. She also gave us a package of money off coupons and a little booklet of recommended shops and cafes….. Other walking tour companies need to watch out. 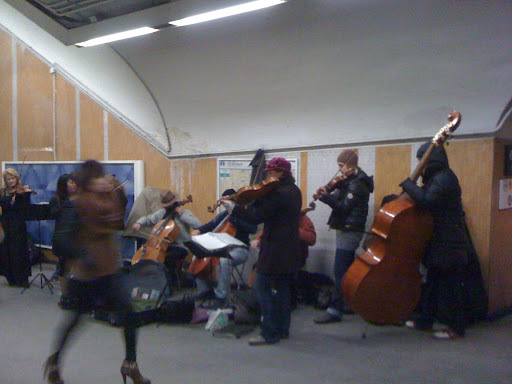 ..and finally I was treated to a great free concert from the string orchestra at the Chatelet metro, on my way home. Hi Murielle, nice to see you got home to Oz safely.yes the meal at madame Nicole was wonderful as ever. I had the prunes again!!! Will post pictures as soon as I get time. Busy packing now….sad!